In this assignment we'll enable the camera to follow the player around the play field by writing a simple C# script. 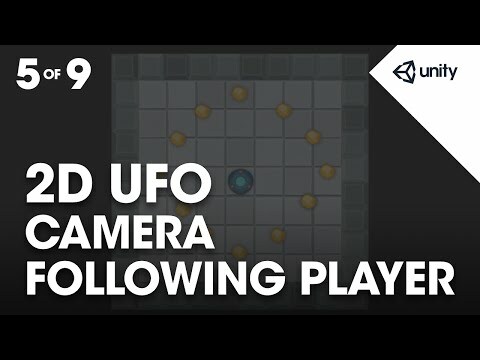 camera moving and following the player. Currently the camera is stationary. a child of the Player game object. in a one way connection. and maintain it's relationship to the parent. parent will not be moved. camera as a child of the Player. Let's test this in play mode. begins to spin and things go a little crazy. relative to the Player's game object. so the camera's point of view rotates with it. This may make us, or our audience, queazy. setup for this particular game. values in the child's transform. above the Player in the hierarchy. not as a child but with a script. to add a new script. And let's name the script CameraController. it will prompt us with the New Script button. or enter key to confirm our selection. We need two variables here. to hold our offset value. Then type private vector3 offset. This will be the offset value. minus the Player's transform position. to the same game object. as the parent object spins. However, Update is not the best place for this code. and set the position of the camera. it's best to use LateUpdate. Let's change Update to LateUpdate. items have been processed in Update. has already moved for that frame. And now we get the behaviour we want. without rotating when we collide. and placing our special pickup objects. //Calculate and store the offset value by getting the distance between the player's position and camera's position. // Set the position of the camera's transform to be the same as the player's, but offset by the calculated offset distance.